Intel has announced the closure of AppUp, its PC app store. The firm has cited the need to focus, "on developing the next generation of platform innovation" as the reason for the store's demise. AppUp will close its doors on March 11 2014 with support provided via email until June 15. 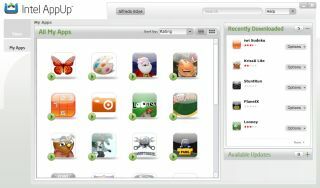 Users have been advised to keep the AppUp client installed and update it following the closure of the store to ensure that downloaded apps continue to work. Intel has advised that most applications should continue to work as normal and that refunds will be offered for apps that users have paid for. A number of apps that use a special technology that protects them from being pirated or duplicated will work until May 15 2015. AppUp was launched in 2010. Its initial focus was netbooks with a view to eventually catering for other devices as well, such as smartphones and TVs.